“I believe in our products and how good they are.” A Washington pet supply owner puts her money where her mouth is by living on dog and cat food and treats for 30 days. 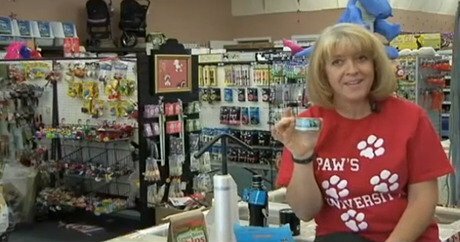 A pet supply store owner in the Pacific Northwest is making headlines today for putting her money where her mouth is. Dorothy Hunter, owner of the Paw’s Natural Pet Emporium stores in Richland and Kennewick, Washington, made the decision to go on a dog and cat food-only diet for 30 days to prove the food products she sells for pets are indeed healthful. Hunter tells NBC affiliate KNDO the idea came to her one day while she was working at one of her shops. For those who cringe at the thought of munching on their Hound’s chow, the food at Hunter’s stores actually sounds pretty tasty. From fresh, freeze-dried chicken and salmon to fruity treats, Hunter says she has been impressed with what she’s eaten so far. But Hunter isn’t just doing this diet for kicks. Hunter says that with the right diet, our pets can eat better than us. “I decided to eat this food for a month just to prove how good it tastes, as well as showcase its nutrition,” she adds. But even a passionate canine and feline foodie like Hunter has her limits; the pet supply shop owner says she is staying away from raw food.